A toxicology journal has issued an expression of concern for a group of papers about the controversial herbicide glyphosate after concluding that some of the authors didn’t adequately disclose their ties to the maker of the product. 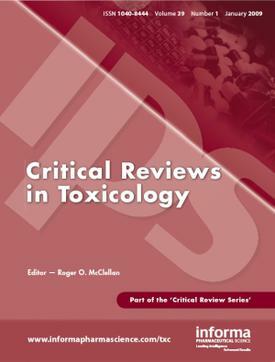 At issue are five articles that appeared in a 2016 supplement to Critical Reviews in Toxicology, a Taylor & Francis title, about the chemical, the active ingredient in Monsanto’s blockbuster weed-killer Roundup. Although the authors of the articles don’t overlap perfectly, Keith Solomon, of the University of Guelph, in Canada, appears on three of the articles; Gary Williams, of New York Medical College, appears on three as well. Williams was caught up in a ghost-writing scandal after court documents revealed that he had put his name on a published paper written by Monsanto employees. Solomon served on a panel funded by Monsanto that undercut the conclusions of a report from the World Health Organization that glyphosate is probably cancerous to people. Williams, G. M., Aardema, M., Acquavella, J., Berry, C., Brusick, D., Burns, M. M., de Camargo, J. L. V., Garabrant, D., Greim, H. A., Kier, L. D., Kirkland, D. J., Marsh, G., Solomon, K. R., Sorahan, T., Roberts, A., & Weed, D. L. (2016). A review of the carcinogenic potential of glyphosate by four independent expert panels and comparison to the IARC assessment. Critical Reviews in Toxicology, 46(S1), pp. 3–20. Solomon, K. R. (2016). Glyphosate in the general population and in applicators: a critical review of studies on exposures. Critical Reviews in Toxicology, 46(S1), pp. 21–27. Acquavella, J., Garabrant, D., Marsh, G., Solomon, K. R., Sorahan, T., & Weed, D. L. (2016). Glyphosate epidemiology expert panel review: a weight of evidence systematic review of the relationship between glyphosate exposure and non-Hodgkin’s lymphoma or multiple myeloma. Critical Reviews in Toxicology, 46(S1), pp. 28-43. Williams, G. M., Berry, C., Burns, M. M., de Camargo, J. L. V., & Greim, H. A. (2016). Glyphosate rodent carcinogenicity bioassay expert panel review. Critical Reviews in Toxicology, 46(S1), pp. 44–55. Brusick, D., Aardema, M., Kier, L. D., Kirkland, D. J., & Williams, G. (2016). Genotoxicity Expert Panel review: weight of evidence evaluation of the genotoxicity of glyphosate, glyphosate-based formulations, and aminomethylphosphonic acid. Critical Reviews in Toxicology, 46(S1), pp. 56–74. We have requested corrigenda from the authors to provide additional disclosure as to contributions to the articles. To date, we have only received corrigenda for three of the five articles that have been agreed by all authors. We have not received an adequate explanation as to why the necessary level of transparency was not met on first submission. We thank those who brought this matter to our attention. When reading the articles, we recommend that readers take this context into account. We will continue to work to update these articles and ensure full disclosure of all contributions to them. Although the Committee on Publication Ethics says failure to disclose a major conflict of interest can be grounds for retraction, journals almost always choose to issue corrections instead. At the time of this writing, our database of retractions shows 114 removals of papers for undeclared conflicts of interest, less than 1 percent of the more than 18,000 total retractions, and most of those include other reasons without which the article more than likely wouldn’t have been retracted. The first paper in the Critical Reviews in Toxicology list, a synopsis of the other articles, was written by a consulting firm called Intertek Group Plc., which received funding from Monsanto. That much initially was disclosed. However, according to Solomon, emails revealed in court documents after the supplement appeared showed that at least one Monsanto employee had made comments on the four other articles — a fact that was not revealed to the journal. Solomon said the editors contacted the authors “a couple of months ago” asking for much more comprehensive disclosures, which he has provided. There was no guidance provided at that time when we wrote [the initial] statements. You don’t know what to put in if they don’t give you guidance. I was surprised that they were basically wanting to know everything that you’d ever done. Solomon isn’t angry about the developments, but he does believe the disclosure system needs refining. For starters, he said, journals should come up with reasonable time-frames for such statements. And they should try to identify what constitutes a true conflict. If I talked to someone at a meeting seven years ago who worked for Monsanto, is that a conflict of interest? Regarding the half-@$$ explanation for his lack of knowledge of how to properly disclose COI, Solomon says, “There was no guidance provided at the time we wrote the statements”; meanwhile, Critical Reviews was ICMJE listed in 2010. Whatever, guy, all it really takes is a little common sense. We are moving towards a situation where anyone who knows something about an issue is barred from talking about it on conflict of interest grounds…. CoI is about the financial interests of individuals and companies involved in research and the relationships between them. The only people who need to be concerned are those who would choose to obfuscate such interests and relationships. When an industry sponsor funds work, and then plays a role in it’s reporting that they did not disclose, a reader would not be fully informed with regards to judging the objectivity of the work. Don’t you think it’s important for us to be able to judge the objectivity of research reports? The only people who need to be concerned are those who would choose to obfuscate such interests and relationships. That’s speculation and not even true; there are many reasons to be concerned when you’re taking part in this battle. But more seriously, I don’t like the tone of the main article at all. Williams was caught up in a ghost-writing scandal after court documents revealed that he had put his name on a published paper written by Monsanto employees. This part is unfair – Williams should be given a chance to answer these allegations; also SciMag now says “Update: After quick review, medical school says no evidence Monsanto ghostwrote professor’s paper”, so people should hold their horses. OTOH, quoting anti-Monsanto lawyers hardly can represent the truth out there; these people (lawyers) have a strong CoI! Solomon served on a panel funded by Monsanto that undercut the conclusions of a report from the World Health Organization that glyphosate is probably cancerous to people. I don’t know (sorry about that) whether this is even somehow true in the first place, but this part also has the very convenient dependence to a grammatical feature of English. A panel ‘funded by’ Monsanto may have recieved some money (which is rather expected because this glyphosate is Monsanto’s interest), or have been totally /owned/ by Monsanto. The sentence does not make any distinction between a total object and a partial object. In some languages, you would effectively say ‘recieved all its funding’, or ‘recieved some funding’ depending on what you are claiming. In English, it is all natural to hide this aspect and leave the misleading conclusion to the reader. So in detail, which way the alleged funding was? What comes to prohibition, glyphosate is not nearly so dangerous it should be banned. So what’s left is the left’s uncanny habit to choose ‘enemies of the people’ and attack them – sometimes for decades as in Monsanto’s case – for the ‘good’ of the people, but in fact causing some deep collateral damage. The question is how to do and fund research on politically highly charged, economically significant topics. Because hate-mail, threats and careers failing are some basic stuff here. Disclosure. I have been using glyphosate for hobby gardening. I regard ‘organic’ goods a first-world problem. The ICMJE guidelines are CRYSTAL clear. To say there was “no guidance” is a cop out after one is caught hiding or wrecklessly failing to disclose COI. From ICMJE: Public trust in the scientific process and the credibility of published articles depend in part on how transparently conflicts of interest are handled during the planning, implementation, writing, peer review, editing, and publication of scientific work.